Description: Program focuses on the trend in deaths occurring in the workplace. More people are being killed by violence at work than actual on-the-job injuries. This program was commissioned by Texas Workers' Compensation Commission, and explains the problem and how to protect employees. Excerpt: You hear it on television, you see it in the newspaper, younever expect it to happen to you. We’re talking about violence in theworkplace. Violence in the workplace happens in restaurants, post offices,convenience stores, manufacturing facilities, construction sites, deliveryservices, hospitals, just about every workplace across the nation and in everycountry. The problem continues to get worse, not better. This program isdesigned to explain what workplace violence is, and more important, how you canhelp prevent workplace violence and homicides in the workplace. We’ll also giveyou some personal security tips you can use at home, work, recreation, andanywhere else. Just remember that it can happen to you. There aren’t manystatistics or information available on violence and homicide in the workplacethough researchers are beginning to turn their attention to this issue. Let’squickly review some of the information we’ve obtained from a variety of sourcesjust to make a point about this type of activity. If you’d like to do your ownresearch all you have to do is read the newspaper every day. It’s happening.Every one is at risk so it’s important to develop the attitude that it couldhappen to you, anywhere, anytime. According to the national traumaticoccupation fatalities report completed over the six year period from 1980 through1985 by the national institute for occupational health, or NIOSH, homicides wasthe 3rd leading cause of occupational injury death in the UnitedStates, accounting for nearly 13% of thenation’s total deaths from trauma in the workplace. Homicide was the manner ofdeath for 12% of the men and 42% of the women. Over 1/4th ofworkplace homicide were 25 to 34 years of age, but workplace homicide rateswere highest among those 65 years and older. At the industry division level 33%of workplace homicide victims we employed in retail trade. 19% in serviceindustries, and 11% in public administration. Keep in mind that homicide dataare not available from 4 states and these states account for approximately 10%of the U.S.population, therefore the real number of workplace homicides were greater thanthe study showed. Additional analysis of statistics indicated that the hour ofoccurrence with the greater frequency of work related homicide was midnight to 12:59AM. This time period was followed by 10PM to 10:59 PM, and 11PM to 11:59PM.The three hour period from 10 PM top 12:59 AM accounting for 20% of these homicideevents. The methods of homicide reveal that firearms accounting for 75% of thedeaths while cutting and piercing instruments accounting for another 14%.Females were six times as likely as males to have died as a result ofstrangulation, and females were more likely to have died have wounds inflictedby cutting or piercing instruments. 40% of the deaths occurred in the southernregion of the United States.The west accounted for 24%. While the northcentral and northeast regionsaccounted for 19% and 8% respectively. We do have some statistics for the stateof Texas. The two year periodfrom 1990 through 1991 there were a total of 199 workplace homicides in Texas.168 of those homicides involved males. 31 involved females. One hundredeighteen deaths were white workers, 44 black, 33 were asian or pacificislander. Hispanics accounted for 25 homicides in the workplace. The age groupbreakdown showed that workers aged from 25 to 34 had 56 deaths. Workers aged 35to 44 also had 56 deaths. 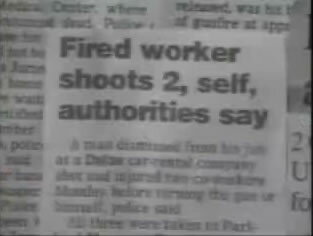 Overall in 1991 workplace homicide became the leadingcause of traumatic workplace death in Texas.What does this mean? It means that preventive measures have not been effectivein some organizations. And that additional measures in the workplace must beadopted to reduce or eliminate these incidents and deaths. The United StatesPostal Service has had its share of notoriety in workplace homicide as well.Before we discuss the postal service its important to understand they have over700,000 employees which is a very large number of employees.